Uttaranchal has a cultured and colourful society. 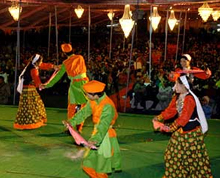 The religious, social and cultural urges of the people of Uttaranchal find an expression in various fairs and festivals, which are in turn closely linked to the social and economic activities of the region. Known as Garhwali or Kumaoni, the people of Uttaranchal take pride in their origin, separating themselves with the rest of the people of India by the term “pahari”, meaning the “people of the mountains”. Almost 90% of the population of Uttaranchal is Hindus, with some of the major centers of Hinduism in India being located in the Uttaranchal. Kumbh Mela and the Ardh Kumbh Mela which are held in Haridwar after an interval of 6 and 12 years are one of the most important Uttaranchal fairs and are famous the world over. Besides these, a number of other fairs are held in the state as well. The main language used in Uttaranchal is the language of Garhwali and is widely used in its colloquial form almost all around the state of Uttaranchal. Almost each part of the state has a special dialect of the language of Garhwali, a trait which can be best illuminated by the various songs and verses of the locals Folk songs form an integral part of the colorful culture of Uttaranchal. Chhopati are love songs sung as questions and answers between men and women. Chounphula and Jhumeila are sung from the time of Basant Panchami that stretches till Sankranti or Baisakhi. Basanti folk songs in Uttaranchal are sung to welcome the Spring season. Mangal songs are marriage songs. Jaggar are devotional songs to God. Bajuband are conversational songs between men and women in the shepherds’ community. Khuded are songs sung when a wife parts with her husband. The Chhura folk songs of Uttaranchal, which are very popular amongst shepherds, are meant to teach trade tricks to a shepherd. Another interesting part of the culture of Uttaranchal is its folk dances. The Bhotiya dance is performed by the Bhotia community during death ceremonies. The Barada Nati folk dance is performed by men and women attired in colorful costumes during special occasions and religious festivals. The Pandava dance, performed during Dussehra and Deepawali, portrays tales from Mahabharata. The Langvir is an acrobatic folk dance of Uttaranchal performed by men. Kumaonese culture is strongly patriarchal and based on the foundation that men are superior to women. Women are given due respect and they are allowed to work right beside men in fields and forests, but men are dominating. Society is based on the large extended family with the eldest male as its head. Polygamy is generally accepted but polyandry is strictly prohibited. Another practice viewed as old-fashioned in most of India still finds general approval in Kumaon. In direct violation of the law, the practice of child marriage still persists.